After the Conquest the Manor was held by Baldwin de Brionne, the Norman Sheriff of Devon, before it passed into the possession of other notable Normans during the 12th and 13th centuries. Among them were the Cruwys, Davels and Wyllyton (or Champernowne) families. 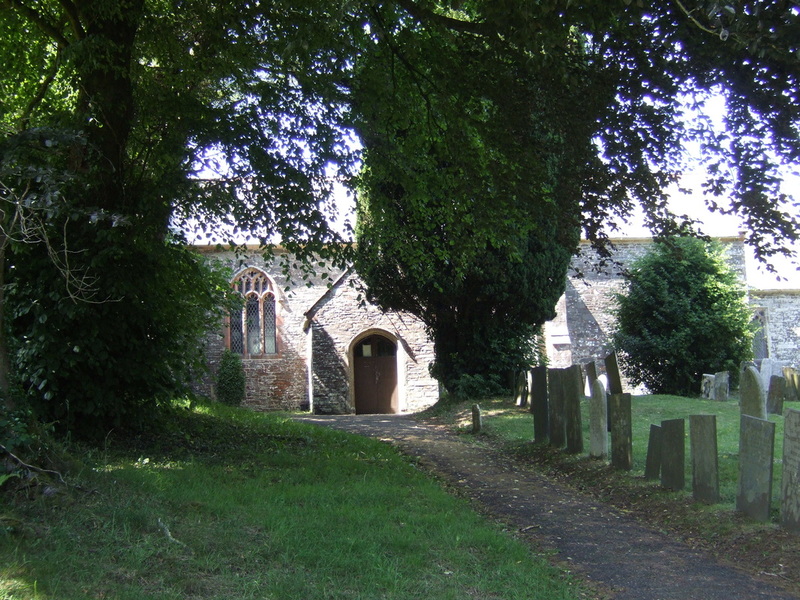 The first recorded Vicar of Little Torrington, Humphrey, was instituted as early in 1259, so the present 15th century building must have replaced an earlier one. Since the 15th century, the church has been renovated several times. It was re-roofed in 1755 when the interior was also re-ordered in typical Georgian style. According to a later description the church was "shabbiness smothered in whitewash, full of unsightly boxes or pues, and a hideous gallery at the west end." The next major renovation took place in 1857, during the incumbency of the Reverend George de Carteret Guille, when the nave and south aisle were restored, the western gallery removed, and the chancel rebuilt and enlarged. Nine years later, however, in 1866, further restoration work had to be carried out when the timbers of the roof and floors were found to be so badly affected by dry rot that they had to be completely renewed. The last major renovation was in 1898, during the incumbency of the Reverend Thomas McClelland, when restoration work was carried out on the tower. 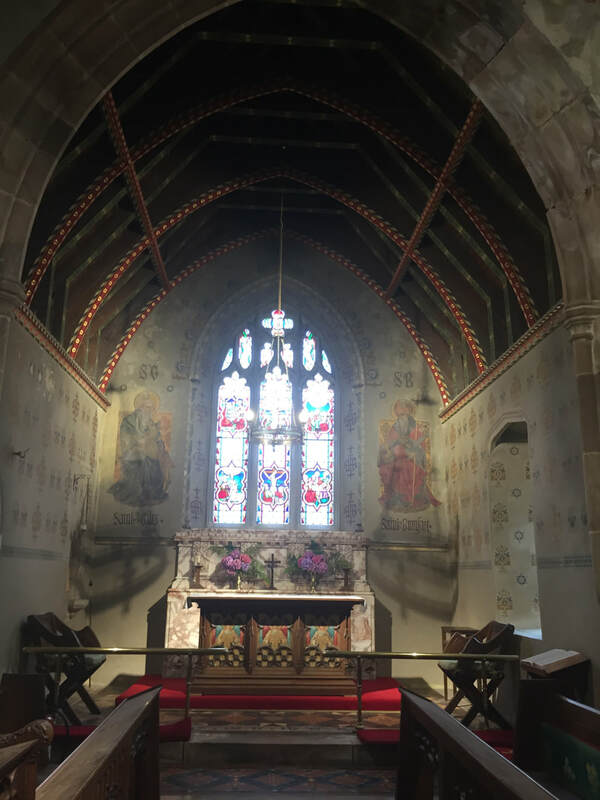 At the same time, the interior of the church was beautified by the addition of the tower screen and new pews - designed by Mr Harbottle Reed, an Exeter architect. 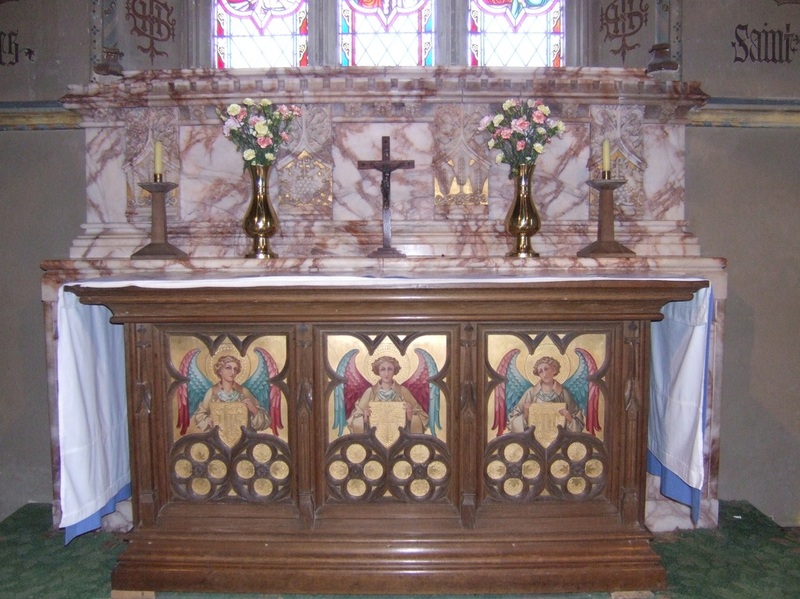 The Sanctuary was lavishly decorated and the altar (previously installed in 1858) provided with a marble reredos as a memorial to the previous Rector, the Reverend George de Carteret Guille. The most striking exterior feature is the Tower, which although of modest size (67 feet high and very slim) is prominent in the landscape because of where it stands. It was built to replace an earlier one destroyed by lightning in 1438. Parishioners who contributed to its rebuilding were then granted an Indulgence of 40 days. The new tower contained four bells, which were still being rung in the reign of Edward VI (1547-1553). They may not have been replaced until 1804 when five new bells were cast by John Pennington, the Exeter Bell Founder. A sixth bell was added in 1907. The tower Clock was given by Mrs Ada Mary Guille in 1904 in memory of her husband Henry Stevens le Marchant Guille, a Major in the Royal Artillery, who was killed in 1900 at Kimberley in South Africa during the Boer War. the slate sundial of 1771, above the outer modern door, with its Latin inscription "fugit irreparabile tempus", meaning "time flies irrevocably". the large medieval iron handle on the door. This is almost certainly a Sanctuary Ring used in medieval times by fugitives seeking safety from violence or arrest. The Font is the most ancient feature. Standing on a 15th century base, it is either Saxon (11th century) or Norman (12th century) in origin, so almost certainly belonged to the original church on the site. Its unusual cushion-shaped bowl, curiously cut into four rounded divisions, is unlike any other in Devon, and may be unique. (If you know of a similar font elsewhere, please tell us.) The font's oak cover with its four arched wreaths surmounted by a dove, the symbol of the Holy Spirit, is also unusual. Apart from the dove, which is of more recent origin, the cover is probably Jacobean. But traces of the hinges and lock from the pre-Jacobean cover can be seen on top of the font bowl. They remind us that when fonts were kept full and blessed once a year, the covers were locked to prevent the holy water from being stolen for superstitious purposes. By the font (except in Eartertide) stands the large paschal candle, representing the Risen Christ, the light of the world. It is lit at a baptisms and funerals. The architectural glory of the church's interior is the arcade with four bays dividing the nave from the south aisle. The five monolith granite pillars may have been brought over from Lundy Island. The simple capitals are decorated in 15th century style with a variety of curious ornamental carvings, including monograms and emblems. Many cannot be identified. But among the monograms are the letters I N R I on three different pillars, are the initial letters standing for the Latin words meaning "Jesus of Nazareth, King of the Jews" the title Pontius Pilate put on the Cross in Hebrew, Latin and Greek. Some of the other letters may be the initials of the church's patrons or benefactors. Emblems of the Passion can also be identified, together with those of various trade guilds involved in the building of the church, and some emblems may possibly represent the parish's seven ancient Manor Houses. Among the other identifiable carvings are a St Andrew's cross, a traditional cross, and a chalice. The oak pulpit was given in 1912 by Mr A.P. Brooke Leeds of Cross, and was later equipped with panels in memory of the Reverend Henry D.F. Pollock, Rector from 1908 to 1941. The church's former pulpit, installed in 1849, was originally situated next to the door in the north wall. Until 1898, when the pulpit was lowered and moved forward, the preacher entered it through this door from the vestry where an alcove with steps still leads to it. Until the Reformation in the 16th century, the doorway was the entrance to the rood loft, which separated the chancel from the nave. Neither the date nor the origin of the carved oak eagle Lectern is known, but there is a similar one in the church at Dolton. The Altar replaced the former holy table which now stands opposite the door against the north wall on. It was given in 1858 by Mr Kirby, a Coachman in the service of Sir Trevor Wheeler of Cross. Made of oak, its front has three unusual painted panels of the three archangels Gabriel, Michael and Raphael, who were once described by a child as "the angels reading the Times Newspaper". The Aumbry, situated in the north wall of the sanctuary, was installed in 1991 to reserve the Holy Sacrament. The Wall Paintings on the Sanctuary's east wall, dating from 1898, depict St Giles, the Patron Saint of the church, on the left, and St Boniface, the Patron Saint of the Diocese of Exeter, on the right. The present crude stencilled decoration on the walls covers a lavish Victorian scheme, a small area of which has been revealed low down on the north side. Presumably the decorations were covered over because they had been damaged by damp. Perhaps the money will be found one day to restore the sanctuary to its old glory. The Brass Memorial on the Sanctuary's south window sill is one of the oldest visible memorials in the church, dating from 1636. As its inscription is of historical, as well as parochial, interest, it is quoted here in full. "Here lyeth the body of Jone Phesaunt, wife of Peter Phesaunt Esqr., deceased, Attorney General in the northern parts to the late Queen Elizabeth, and one of the daughters and coheires of Sr. Vincent Fulnetbie, of Fulnetbie in the county of Lincolne, Knight. Shee was in the whole course of her life pious, charitable, discreete, curteous, loveing, and generally beloved, and highly esteemed for her grave and matron-like conversation. 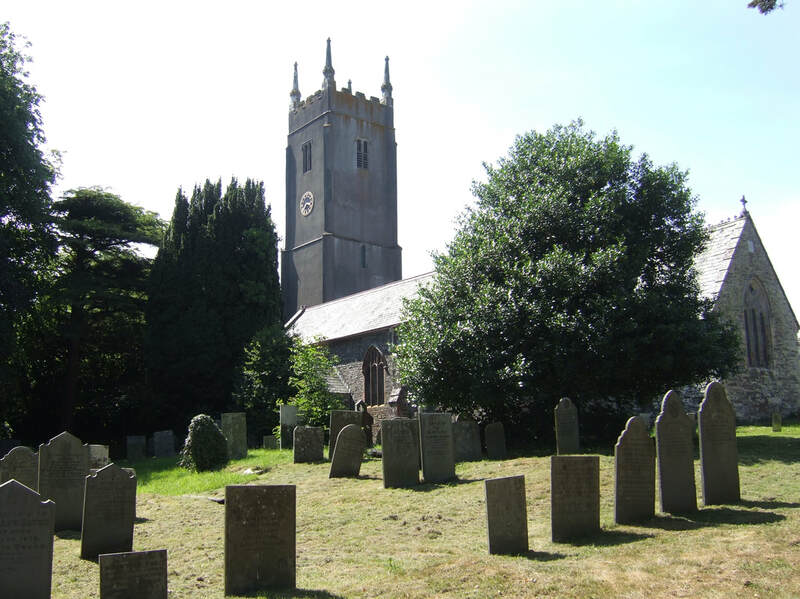 Shee was mother to Susanna, wife of John Phippes, Dr. in Divinity, Rector of this church, and haveing lived a widow 48 years dyed in this parishe the first day of December Ao Dom: 1635 being then above 74 years old." The east window dates from 1857 when the Chancel was rebuilt and enlarged. The window in the north wall of the nave, depicting the Blessed Virgin Mary, is the best one in the church. It was given in 1921 in memory of Edith Louisa Pollen Foulkes of Sinytham, one of the parish's ancient Manors. The south window is a memorial to the Reverend Peter Glubb, Rector from 1803 to 1852. The east window in the south aisle, partly hidden by the organ, is similar in style to the nave's east window. The Organ, installed in 1887 at a cost of £125, has one manual and seven stops. Built by Halmshaw & Sons of Birmingham, it was restored in 1964 by Geo. Osmond & Co. of Taunton. The Organ Screen was made out of panels taken from the 1849 pulpit. There are some fine memorials on the walls, some to members of notable Devon families connected with the parish. 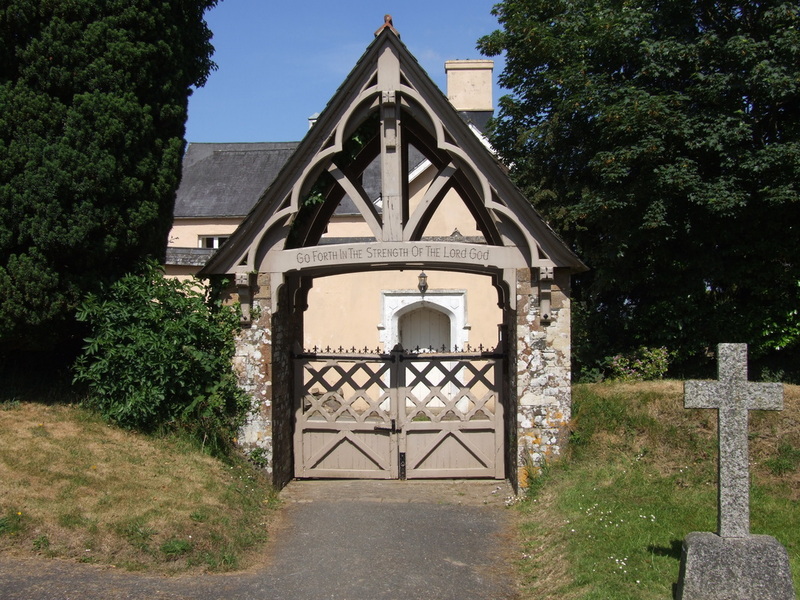 Outside the church, by the lychgate (built in 1860), a granite cross, erected by local subscription in 1920, commemorates the 13 men of the parish who died in the two world wars. Originally, the Chest contained the church's Registers which date back to 1672, but all the older books are now kept with other records of the archdeaconry in the record office at Barnstaple. The Sandwell Security Safe, made by Thomas Withers & Sons Ltd of West Bromwich, was purchased in 1934 at a cost of £12.10.0. The Church Plate includes two Elizabethan chalices. The oldest, hall-marked 1573 and inscribed "Little Torrington", has been in continuous use here since this date. The other, although hall-marked 1600, is inscribed "Given to Little Torrington July 1895". The church also possesses a Georgian paten and flagon, presented to the church in 1753 by Christiana Maria Stevens, widow of Henry Stevens of Cross, and sister of Henry, the first Baron Rolle. 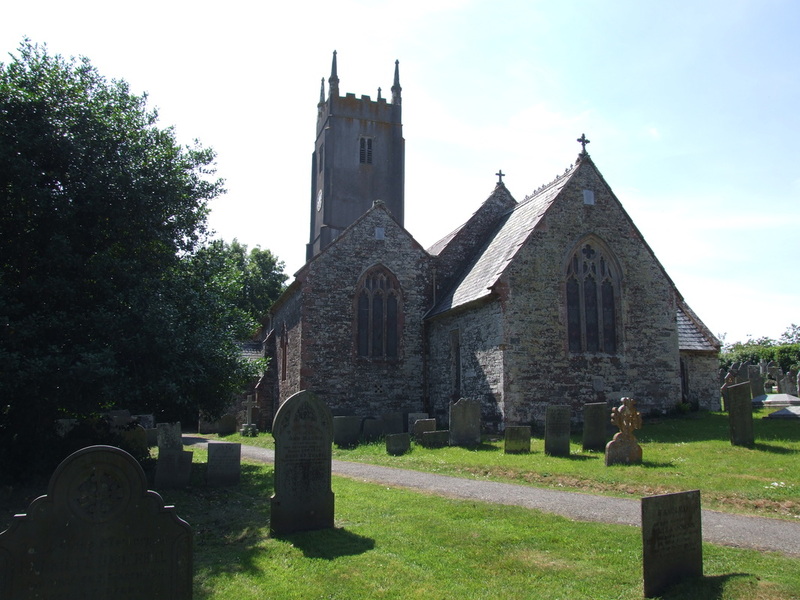 The main source of historical material has been Notes on the History of the Parish and Church of Little Torrington by Beatrix F. Cresswell (Southwoods Ltd., 1937). This guide is substantially the work of the Revd John Allen, with help from Mr Richard Watkins.